The first morning light reaches Big Cottonwood Canyon, and the rays beam onto the new snow crystals, creating a sparkling carpet of snow. Momentarily entranced by the beauty of the Wasatch winter wonderland, I snap my focus back to observing my touring partner for the day. She rapidly heaves shovels of snow, digging a deep snow pit like a wild woman. Smiling between shovel strokes, she eagerly shares her knowledge of snow science concepts and explains the process of analyzing avalanche danger as a forecaster. This is Evelyn Lees. She is the godmother of the Wasatch backcountry. 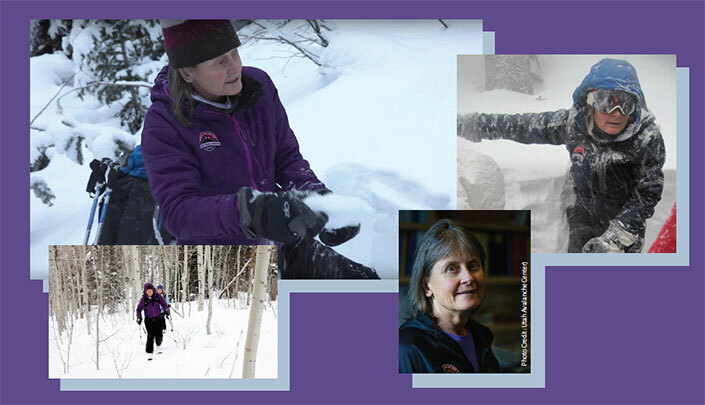 Evelyn has been a backcountry avalanche forecaster and educator with the Utah Avalanche Center (UtahAvalancheCenter.org) since 1989. With over 26 years of experience forecasting avalanche danger in the mountains, she’s the epitome of a strong, passionate mountain woman. The first time I met Evelyn, she was instructing an all-women’s Companion Rescue course at Alta Ski Area (alta.com) hosted by SheJumps (SheJumps.org). It was empowering to be surrounded by a large group of women teaching survival skills led by one of the most competent avalanche educators in the nation. Evelyn’s advice for people interested in taking their sport to the next level in the outdoors is to take control of their own adventure. I was fortunate enough to join Evelyn on an early morning ski tour to catch a glimpse of her work life in the mountains. There are about 170 avalanche forecasters in the United States, but only a few of them specialize in backcountry like Evelyn. 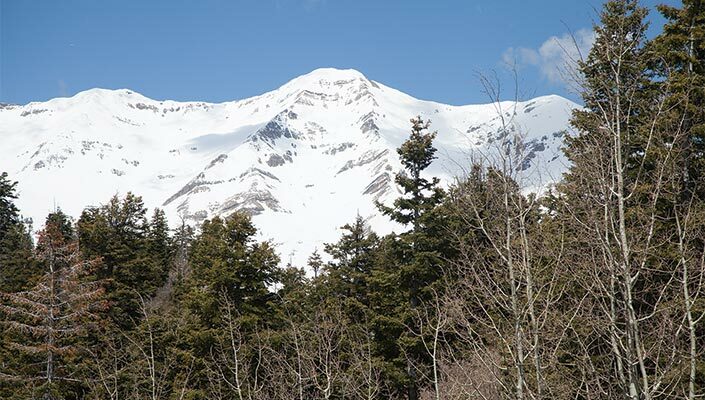 The Utah Avalanche Center where she works, a 501(c)(3) non-profit organization partnering with the Forest Service, has a mission of providing winter backcountry travelers with the tools they need to stay alive and have fun in avalanche terrain. Evelyn’s job involves days in the field, office, and instructing education classes. The goal is to enable people to comprehend the avalanche danger advisory to make smart and safe decisions when traveling in the backcountry. Many other avalanche centers in the U.S. and Canada, as well as the National Ski Patrol have emulated Utah’s Know Before You Go program, which aims to educate the public about avalanche hazards through free presentations. Recreating in enormous mountain landscapes covered with an abundance of snow can be as dangerous as it is beautiful. Avalanches kill about 25-40 people in North America each year. The work of Evelyn and other forecasters at avalanche advisory centers across the country is to share critical information about the current snowpack so backcountry travelers can make safe decisions to mitigate risk. Each person’s safety is based on their own ability understand and assess conditions on the slopes they plan to climb and descend. One aspect of creating the avalanche advisory is outdoor field days, which involve hands-on research in the Wasatch backcountry, digging snow pits to record details of the layers within the snowpack, jumping on test slopes to observe how the layers react, and looking at characteristics of recent avalanches. These field observations are taken at various elevations and aspects to attain an overall understanding of the snow conditions each day. Avalanche problems are identified based on four key elements: type of avalanche, where the avalanche exists in the terrain, how likely you are to trigger it, and how big it will be. Forecasters go to the office co-located at the National Weather Service building at 4:00 a.m. where they have three hours to publicize the avalanche advisory. Evelyn says it’s like you’re solving a puzzle of where the avalanche problems are, what aspects, elevations, and how to communicate it. The team takes information from their field observations, ski areas, people in the backcountry, the weather forecast, and puts them all together to solve the puzzle of stability in the snowpack. With the technology changes over the last 25 years, the UAC has transitioned from communicating with telephone hotlines to doing nearly everything on the Internet, using Instagram, Twitter, and posting photos and videos online. “The most challenging part is sitting in the ‘hot seat.’ You’ve got to hit the advisory publish button on the website and sometimes there’s a nervous moment in the last minute where you’ve got to go, ‘Okay, this is it. I have to make my final decision, and this is my best decision I can make with the information I have,’” says Evelyn. During the final moments of my ski tour with Evelyn, she effortlessly transitions into downhill mode while briefly explaining her past work. Before her career as a forecaster, Evelyn earned degrees in both Geology and Soils, and later worked as a meteorology field technician for a cloud seeding project in Utah. She’s also an American Mountain Guides Association (AMGA) certified alpine guide with a rich history as an accomplished climber and mountaineer across the world where she had to identify the forecast for herself. While in Utah, she began spending time with savvy backcountry skiers who became mentors as her fascination and experience with studying snow grew. Backcountry skiing and snowboarding is safer and more fun when you understand avalanches and their destructive power. Learn the basics of knowing when to go and when to turn back, companion rescue techniques, and how to stay alive in avalanche terrain at these classes taught by the Utah Avalanche Center. For more details about these avalanche awareness classes.